What’s the best thing to do when you’re having a bad day? Rita Dixon was sure her luck should turn for the better soon so she went shopping for lottery tickets. 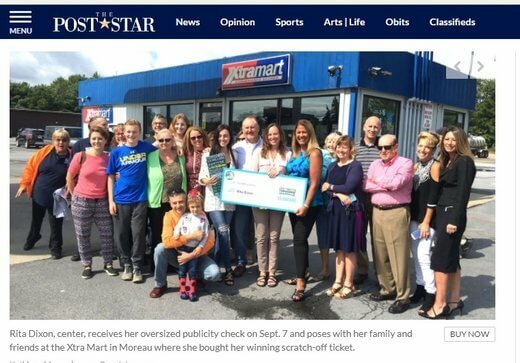 Exhausted after having agreed to babysit a 2-year old Friday night, she used the money she earned to purchase three lottery tickets at the Speedway. She earned $40 on her third ticket so on the way home she decided to stop at the Xtra Mart in Moreau to buy two more. Her first two tickets gave her $20. She went to another clerk to buy another one and was stunned when two numbers matched and the prize contained a lot of zeroes. She had won $3.3 million. She showed the clerk who silently congratulated her. Then she went back to her car and called her husband because she was too excited to drive. When he arrived, the first thing he did was ask to see the ticket! When she got home she phoned her best friend yelling all the while. She signed the ticket at the advice of her brother and kept it safe from the family dog. But now that she has the money, she plans to be prudent. She will buy a Mercedes, but other than that the money will be used to settle debt. And she will continue working as an accountant and occasional waitress.